If you have suffered from a shoulder injury through no fault of your own, you can make a personal injury shoulder claim. We want to help you get the compensation and the support you need to get your life back on track. Beardsells Personal Injury Solicitors understand how difficult and confusing the aftermath of an accident can be, but after speaking to a personal injury lawyer at Beardsells you will immediately feel comfortable that your case is in safe hands. Our aim is to get you the maximum compensation you are owed with minimum hassle, so you don’t have to take on any unnecessary worries at such an unsettled time in your life. 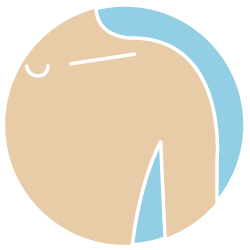 Being victim of a shoulder injury can cause you pain and discomfort for a vast amount of time. If you have been victim of an accident that has resulted in shoulder damage then you will be entitled to claim compensation for damages and loss of earnings. In extreme shoulder damage accidents the victim may have to undergo painful surgery and can have trouble with their shoulder for many years to come. In some case the damage can reoccur in certain circumstances, for example; if you are a keen tennis player your shoulder make become inflamed each time you play a game of tennis. It really can alter your life considerably; this is why it’s important you claim the compensation you deserve. Shoulder injuries are quite common amongst sports players due to the nature of the game, however if you have suffered a shoulder condition that has stopped you playing the sport you love then there is a good chance your compensation claim will be won. 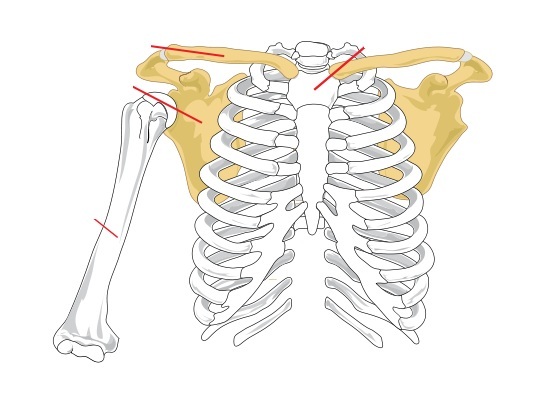 The main bone within your shoulder is the shoulder blade which is medically known as the Scapula. You then have your joint, made up of ligaments, tendons and cartilage. Then to further bones, the humerus which is located in the upper arm and then the collar bone. Car accidents – during a car crash your body is often forced forwards and backwards at an excruciatingly fast pace. Due to seatbelts this can cause major injuries to the shoulder from dislocation to breaks. If you have been thrown from the vehicle or hit by a car then there is a chance you may land on your shoulder, causing a fracture. Slips, trips and falls – if you have had a fall that wasn’t your fault then you can claim shoulder compensation. Often during a fall there is a chance you can land on or twist your shoulder, this leading to extreme pain and medical treatment. Injuries at work – Because rely on our arms and shoulders to do our daily jobs it’s common for injuries to happen at work. People who work with machinery should take extra care whilst at work as this can sometimes be a dangerous environment to work in. If the grievance you have incurred wasn’t your fault i.e. your company could have protected you from the accident, then you are well within your rights to claim. Your current or previous place of work has a legal obligation to protect you whilst you are at work, if they fail to adhere to this then you have a legal right to be financially reimbursed for the pain and suffering you have been through. Claiming compensation for a shoulder condition is simple. The most important factor in the claims process is making sure you chose the right solicitor. Beardsells Personal Injury Solicitors have been in the industry for over 30 years’. In that time we have built up a noble reputation for winning cases. We know what it takes to build a truly unbeatable case. We are not your average personal injury lawyers here at Beardsells. We go that extra mile to make sure our clients feel confident and comfortable when divulging the details of the accident. We realise that some injuries are a personal and sensitive subject. That is why we are careful and professional in the way we approve subjects; we won’t blind you with legal jargon, mislead you with small print or make you feel uncomfortable. Guide you in the correct way to act with employers, witnesses and any other people that may be involved in your case. Give you all the information you need right for the very start, honestly is key. Make sure you win your case! Make sure you win the correct amount for your injuries, you will not be under compensated with us. Work on a no win, no fee basis. If you don’t win, we don’t win either. So to begin taking the steps toward the compensation you deserve call a member of our friendly and professional team today. We can give you all the information and clarity to make a Personal Injury Shoulder Claim. Our number is 0800 677 1911 or 0333 577 2251, both numbers are free to call and we work on a no win, no fee basis. If you’re still unsure about making a claim or you have more questions, send us a message via our contact form. We haven't written any blog posts about Personal Injury Shoulder Claim yet.